RealTime Gaming is as excited about the arrival of the holiday season as everyone else and in celebration launches a brand-new slot titled "Swindle All The Way". Online players get to meet two sneaky thieves planning to pinch the Christmas spirit, the main goal is to prevent the thievery, grab the loot from the robbers and to ensure that everyone celebrates the festive season in a joyful and festive mood. 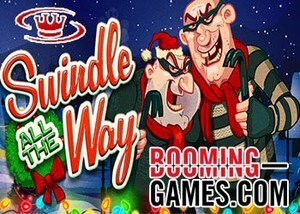 Players at RTG online casinos can look forward to swindling all the way towards great winnings from the 22nd of November when the new Swindle All The Way slot arrives to spread its joy across 5 reels featuring 20 variable paylines. Sensational visuals, brilliantly combined colour schemes, and joyful Christmas melodies guarantee hours of play. Christmas-themed symbols such as Santa's elves, decorated high-card symbols and Christmas stockings can be combined to enjoy an early gift unwrapping session. Several bonus embezzlements are present to ensure ample additional prize opportunities, the two sneaky thieves go wild and substitute for all symbols but the scattered logos. The scatters protest and activate the free spins bonus round once three or more meet on the reels, once activated players get the opportunity to hunt down the robbers. The new Swindle All The Way Slot special feature is activated by three scattered logo's allowing players to select one pick per reel, four or five scattered logo's permit two picks per reel. Free spins are awarded according to the number of scattered logo's present and the robbers found, while a maximum of up to 60 free spins could be enjoyed. During the free spin swindling action, payouts could be multiplied 1x for every robber captured and it is possible to enjoy winnings multiplied by up to 33x. Get in the Christmas spirit, visit La Riviera Casino and take advantage of its $10 no deposit bonus today. The RTG no deposit bonus offers every player the opportunity to enjoy the new Swindle All The Way slot for free. With up to 60 free spins and multipliers worth 33x players could start the festive seasons with mammoth wins worth up to 82,500 times the activating bet. Santa is in an extra generous mood this year and progressive jackpots can be activated in any spin to hand out Christmas winnings worth $1,000 in the major jackpot or $250 in the minor jackpot. RealTime Gaming is an online casino gaming software providers well recognized for popular slot titles such as Caesar's Empire, Cash Bandits, and Aztec's Treasure. RTG online slots can be enjoyed across all platforms including desktop and mobile, all slots are fully optimised for mobile play.